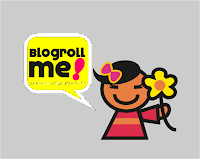 I need to update my list of links: some blogs I link to have ceased to be updated or even to exist and there are new blogs on the scene I haven't yet included. If you think there are any glaring omissions, please leave a comment. Given Oikos' theme, I try to link to really good blogs about environmental economics, Australian economics or Australian environment - or truly outstanding blogs about the environment or economics more generally. 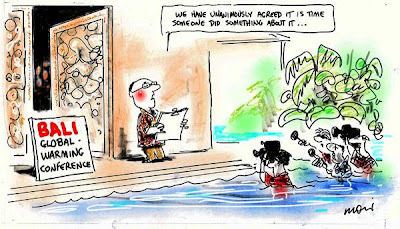 I think this cartoon by Alan Moir pretty much sums it up! Three options in the draft Bali deal will be put to international environment ministers who will meet on Wednesday... and the hope is that a deal will be signed by Friday. The most favoured option is a two-track process. Under this, countries that have ratified Kyoto - Australia has taken the step towards ratification - would continue separate negotiations on the need for deep cuts by 2020 and 2050, and discuss binding targets. A second process would look at commitments from developing countries and the US, which would not be binding but include renewable-energy and energy-efficiency targets, and emissions cuts from polluting industries. Is it really the case that Australia has ratified the Kyoto Protocol just in time to be bound by deep cuts it otherwise wouldn't have been required to make? While I've been galavanting around Europe with its surprising lack of wireless internet, I've missed the appearance of a new addition to the healthy and growing stable of blogs around the world with an environmental economics focus. Common Tragedies is a play on the 'tragedy of the commons' concept, the tendency for overexploitation of common resources. The blog chronicles thoughts on environmental and energy economics and policy from a group of research assistants at Resources for the Future, an environmental policy research centre. The EU hasn't yet released figures for 2006. But from 2000 to 2005, the U.S. outperformed Western Europe. Carbon emissions were up 3.8% in the so-called EU-15 during those years, versus 2.5% in the U.S. Over the same period, there has been virtually no difference between the increase in all greenhouse emissions in the U.S. and EU-15. I'm not sure what the WSJ is suggesting here. Markets won't just "work" and magically ascribe higher energy prices due to help save us from climate change. Governments actually need to somehow interfere in those markets to increase the prices of carbon-intensive energy sources. And there are two basic ways: impose a tax on emissions or require permits for emissions, issue a limited amount of permits and allow them to be traded (cap and trade). Either way, you're putting a price on emissions: only after you've place some constraint on the market can you stand back and let the market "work" to find efficient ways to reduce emissions. They suggest that emissions can be reduced without much of an impact on economic growth. Economic / Business consultants McKinsey have released a study this week that indicates that the US could reduce emissions substantially with little economic cost. They suggest higher energy prices (and by inference a carbon tax) can be quite effective. They might give us clues as to what sort of action could be effective. What was different about 2006 to previous years? Why did the use of natural gas for electricity generation increase? If you're interested, the full report is available (in pdf) from the US Energy Information Administration website. 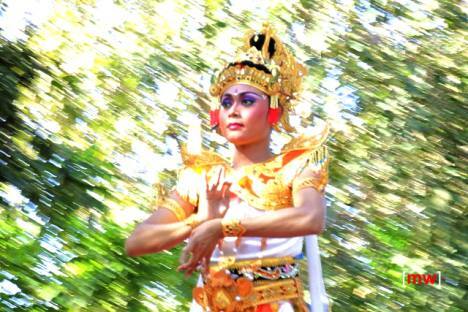 Bali high - or ballyhoo? Can we meet our emissions targets in the first commitment period (2008 - 2012)? What happens after 2012? What will the new Kyoto Protocol or alternative post-Kyoto agreement look like? For the first issue, the die is really cast: there's not much we can change now in terms of domestic policy that will pay big dividends within the next 5 years. The Bali conference will kick off international discussions on the second issue - probably one of the most important things to get right in the coming century. What do you think should be the essential ingredients of Kyoto Protocol Mark II? Australia has today ratified the Kyoto Protocol. Cat and I are back home after a great trip, to a new federal government and some important developments on climate change. Climate change was a prominent issue in the election campaign. My impression is that, while policy differences between the parties on this issue had narrowed since the former Liberal government announced earlier this year that it would establish a carbon trading scheme, the Liberals' regular climate skeptic rhetoric over the past decade (which only really changed this year) resulted in the distinct feeling that they were not genuine about climate change action. A new government was sworn in this morning and its first official act was to ratify the Kyoto Protocol. This will enable Australia to participate properly in international negotiations on climate change for the first time in many years. It also leaves the United States exposed as the only wealthy country that has failed to ratify Kyoto. Whether this will have an impact on domestic politics in the US, particularly with a presidential election in the coming year, will soon be seen. In Australia, the new government has set a long-term target of a 60% reduction in emissions by 2050, with a national emissions trading scheme to be implemented by 2010 to work towards that target. The Bali climate change conference kicked off today, with new Prime Minister Kevin Rudd, Environment Minister Peter Garrett and Minister for Climate Change and Water Penny Wong, to lead the Australian delegation. 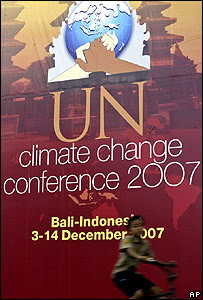 The first commitment period under the Kyoto Protocol begins next year and runs until the end of 2012. The signatories to the Kyoto Protocol have committed to achieving certain (fairly modest) emissions targets on average over this 5 year period. The big task for the international community over the next couple of years, starting in Bali, is to negotiate what happens after 2012. It will be positive for Australia now to be more engaged in this process. Can markets predict global warming? It's been a little quiet at Oikos lately, as work has been particularly busy. I've also started researching for my thesis on whether prediction markets could effectively predict climate change and its impacts - something I've previously talked about. Could a well-functioning market in future temperatures or sea level rises be set up, and how might its predictions compare with the consensus forecasts from the Intergovernmental Panel on Climate Change (IPCC)? Farmers have for generations used futures contracts on commodities such as corn and grain to provide insurance against poor weather and crops. But now financial exchanges are developing products that provide companies and investors with a way to hedge Mother Nature herself. HedgeStreet, a regulated online exchange, also trades hurricane futures and is looking into more potential products that would allow individuals to play global warming... Russell Andersson, HedgeStreet's vice president of instrument origination and a co-founder of the exchange, said other weather-related contracts in the future could be tied to rising ocean levels. "The risk has to be able to be measured in an index for a derivative product to become a candidate," Andersson said. An example would be precipitation or temperature. Should carbon taxes be linked to global temperatures? Could long-term weather markets help us understand the risks of climate change? An illustration of how economics is becoming increasingly important in environmental debates, ACF is advertising for an economist to fill the apparently newly-created position of Economic Adviser. ACF’s advocacy to protect the environment increasingly involves economic analysis, and ACF has set a long-term strategic priority to transform Australia’s economy into one that is ecologically sustainable. As a crucial component of this goal, ACF is developing a programme of work to promote alternative economic tools that incorporate environmental values, and challenging mainstream notions of every-expanding growth in consumption of natural resources. The position of economic adviser is being newly created to assist ACF to develop this area of work rapidly, and to ensure that Australia begins the shift to economic institutions and instruments that fully recognise, account for and protect the environment. More details. It would be an interesting job! The latest issue of The Economists' Voice is out, with two articles on the economics of climate change by Nobel Prize-winning economists. Two factors deserve emphasis, factors that differentiate global climate change from other environmental problems. First, emissions of CO2 and other trace gases are almost irreversible; more precisely, their residence time in the atmosphere is measured in centuries. Most environmental insults are mitigated promptly or in fairly short order when the source is cleaned up, as with water pollution, acid rain, or sulfur dioxide emissions. Here, reducing emissions today is very valuable to humanity in the distant future. typical loci for internalization of externalities, are limited in their remedial ability. The detail in the article is on the issue of discounting future costs, which is central to the findings in the Stern Report on The Economics of Climate Change that susbstantial immediate action on climate change is likely to be much cheaper over the long-term than inaction. Discounting is something I need to cover in a future Oikos 101 column, but for now I'll just observe that Stern has been criticised for using a zero rate of pure social time preference - which is consistent with the idea of inter-generational equity but inconsistent with observations by economists of how people actually behave. Arrow conducts a sensitivity analysis, plugging different social time preference rates into Stern's figures, and finds that using a higher social time preference rate doesn't change the fundamental finding of the Stern Report, that action will cost less than inaction. In some public discourse, and in sentiments emanating from the Bush Administration, it appears to be accepted that uncertainty regarding global warming is a legitimate basis for postponement of any action until more is known. The action to be postponed is usually identified as “costly.” (Little attention is paid to actions that have been identified as of little or no serious cost.) It is interesting that this idea that costly actions are unwarranted if the dangers are uncertain is almost unique to climate. In other areas of policy, such as terrorism, nuclear proliferation, inflation, or vaccination, some “insurance” principle seems to prevail: if there is a sufficient likelihood of sufficient damage we take some measured anticipatory action. At the opposite extreme is the notion, often called the “precautionary principle” now popular in the European Union, that until something is guaranteed safe it must be indefinitely postponed despite substantial expected benefits. Genetically modified foods and feedstuffs are current targets. (One critic has expressed it as, “never do anything for the first time.”) In this country the principle says that until a drug has proven absolutely safe it must be deferred indefinitely. economic sense, or any other kind. Weigh the costs, the benefits, and the probabilities as best all three are known, and don’t be obsessed with either extreme tail of the distribution. An article in today’s Sydney Morning Herald, which questions whether the Australian states could undermine national action on climate change, illustrates just why a broad-based national emissions trading scheme would be effective. The NSW Treasurer [Michael Costa] favours building a new coal-fired power plant to meet the state's energy needs, in contrast to other proposals for more gas-fired generation or energy efficiency and demand management. New coal-fired power stations would make it difficult for a federal Labor government to reach its target of cutting emissions by 60 per cent by 2050, said the Australian Conservation Foundation campaigner Tony Mohr. "The really interesting question to ask Kevin Rudd would be if Costa approves a new coal-fired power plant, what will he do about it?" Mr Mohr said. "How is he going to deal with the parochialism of the states? The power of an emissions trading scheme or carbon tax is that it imposes the same price on greenhouse pollution from any source in any state, so questions like these become irrelevant. Both major parties have now committed to a national emissions trading scheme. With a trading scheme, the federal government sets a cap on total emissions from all sources and issues permits for that amount. Emitting without a permit is prohibited so total emissions don’t exceed the cap. If you don’t have enough permits for the pollution you wish to create, you need to buy them from someone else. They can only sell them if they’ve taken action to reduce their emissions so that they have surplus permits. Under an emissions trading scheme, if NSW wants to approve a coal-fired power station, so what? For the station to be allowed to operate, the operator will need to buy enough permits to cover its emissions. It can buy them only if someone else reduces their emissions and so has surplus permits. The total level of emissions is therefore unchanged. It will no longer be up to the NSW Government to decide whether a new coal-fired power plant, more gas-fired generation or energy efficiency and demand management is the best way to meet the state's energy needs: all those methods will compete side by side on the basis of bang for your cost-of-pollution-adjusted buck. So what is a parochial state government that wants to encourage coal-fired power production to do? Well it can offer breaks from state taxes and planning restrictions, but that’s not a good look. Importantly, it can’t exempt power stations from emissions trading, because it’s a scheme administered by the federal government. If it really wants to encourage the power station, it will have to agree to buy the permits for it. (Scarily, they’ve already started doing this). And this is one thing I love about a national emissions trading scheme: it puts a price on pollution for everyone to see. State governments place costs on their citizens every time they exempt a large development from laws that apply to everyone else, but those costs are hidden. Voters don’t notice the cost of a government exemption, but you can bet they’ll notice when their taxes are used to buy permits for a large and profitable energy company. When we put a price on polluting, we bring hidden costs into the open. Only 4 sleeps to go until the Live Earth concerts around the world - in New York, London, Johannesburg, Rio de Janeiro, Shanghai, Tokyo, Sydney and Hamburg on 7/7/07 - this Saturday! By the way, I have a couple of spare tickets to the Sydney concert, so email me at ozelaw [at] yahoo [dot] com [dot] au if you missed out. Check out the Sydney concert website for lots of good material about the concert and the cause. An interesting article in The Economist last month took a look at the cost of various options for reducing greenhouse emissions (summarised in the graph above). There are a number of options that have a negative cost. In other words, not only would they reduce emissions, they’d also save us money. The biggest one is insulation and low-energy lighting is also up there. The solutions we hear a lot about – such as wind, solar and carbon capture – are among the most expensive options. So why are we not voluntarily making decisions that would not only reduce emissions but also save us money? The Economist identifies a couple of possible reasons, the most compelling to my mind is that the people who make the choices are not the people who pay the costs of those decisions. For example, property developers have to pay for insulation but they won’t get the benefits of lower electricity bills, so their incentive is to go cheap on insulation. If the property is to be rented out, it’s not even the buyer who pay those bills – it’s a tenant. How to solve this? In theory, awareness of the issue should be enough: if tenants and buyers of new houses (or other buildings) are aware that good insulation can save them substantial amounts of money, they should demand it and be prepared to pay more for it – in the same way they’d be prepared to pay more for a good bathroom or kitchen. So why isn't this happening? And seeing as it doesn’t seem to be happening, is there a role for government in mandating it in building standards or requiring developers and sellers to at lease provide understandable information (eg, energy efficiency ratings)? Coming soon to an Australian high school near you? 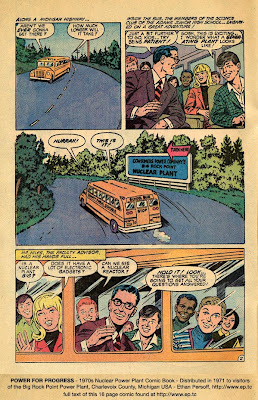 More nuclear fun at Ethan Persoff's site. I’ve mentioned before the possibility of creating markets in long-term weather – that is, betting on future climate change – as a method of predicting and insuring against climate change. Betting markets are good at predicting future outcomes – you can look at the odds on horses in a race if you want to get an idea of who’s likely to win. The idea is that allowing climate scientists, businesses, etc to bet on future climate change would be a way of aggregating all the knowledge that people have about likely future climate change in a way that’s more decentralised and independent than say the consensus method of international scientists at the Intergovernmental Panel on Climate Change (IPCC). There are advantages and disadvantages of either way of distilling the information from thousands of climate scientists into consensus estimates of likely climate change. This tax rate is low, and would yield very little emissions abatement. Global-warming skeptics and opponents of greenhouse-abatement policy will like that. But would global-warming activists? They should -- because according to them, the tax will climb rapidly in the years ahead. Under the T3 tax, the regulator gets to call everyone's bluff at once, without gambling in advance on who is right. If the tax goes up, it ought to have. If it doesn't go up, it shouldn't have. Either way we get a sensible outcome. best of all, the T3 tax will encourage private-sector climate forecasting. Firms will need good estimates of future tax rates, which will force them to look deeply, and objectively, into the question of whether existing climate forecasts have an alarmist bias. The financial incentives will lead to independent reassessments of global climate modelling, without regard to what politicians, the IPCC or climatology professors want to hear. (This is the advantage too of a long-term weather market. Presumably McKitrick’s proposal would lead to the development of such a market so that energy-intensive industries could assess - and hedge - their exposure). There are a few potential problems with the proposal that immediately spring to mind. The first is that it relies on the fact that “climate models predict that, if greenhouse gases are driving climate change, there will be a unique fingerprint in the form of a strong warming trend in the tropical troposphere”. But what if that isn’t the case? McKitrick’s claim is that his proposal takes the scientific debate out of the policy response, but it relies on climate model predictions that troposphere warming reflects man-made emissions and leads other warming. If he’s prepared to accept this finding, why not go the step further and accept the estimates of warming presented by those models and then base the level of tax on those? It also doesn’t really deal with the problem of lag periods: the tax paid now depends on the level of warming now. But the purpose of the tax is to prevent increased warming in the future: surely its level should be based on an assessment of what’s required to constrain future temperature increases. McKitrick’s answer is that “investors planning major industrial projects will need to forecast the tax rate many years ahead, thereby taking into account the most likely path of global warming a decade or more in advance”. And that’s no doubt true for major industrial projects. But household consumers of electricity and petrol will make their decisions based on today’s prices. A related problem is that it doesn’t deal with dangerous thresholds. The tax is linear: it increases by US $20 for every 1 degree rise in temperatures. But damage isn’t linear. What happens if our best science suggests that damage will be moderate up to, say, two or three degrees but that, above that, there will be feedback loops and greatly increased risks of catastrophic damage? If that was the case, we’d want an aggressive tax before those dangerous levels are reached. McKitrick’s tax would only start becoming aggressive once those levels were passed, by which time even much higher tax rates may have become much less effective. It’s an interesting idea though that deserves some attention and debate. I think it’s interesting that market approaches may help not only with developing effective and low-cost policy responses, but may also help improve our understanding of the science on which policies must be based. The first issue of the Review of Environmental Economics and Policy is out and articles can be downloaded for free. Looks like there's some interesting articles, with a focus on carbon taxes and emissions trading. Who do you trust with the challenge of climate change? We must get this right. If we get this wrong, it will do enormous damage to our economy; to jobs and to the economic wellbeing of ordinary Australians, especially low-income households. The question I pose to the Australian people, quite directly, is this: who do you trust to take the vital decisions about our future? I announce specifically that Australia will move towards a domestic emissions trading system, that’s a cap and trade system beginning no later than 2012. Secondly, we will as a nation set a long term aspirational goal for reducing carbon emissions but we need to assess very carefully with detailed economic modelling the impact any target will have on Australia’s economy and Australian families, this target will be set next year 2008. Thirdly, the scheme will be national in scope and as comprehensive as practicable, designed to take account of global developments and to preserve the ompetitiveness of our trade exposed emissions intensive industries. Fourthly, Australia should not pay higher energy costs than necessary to achieve emissions reductions, in other words, governments need to let the market sort out the most efficient means of lowering emissions with all low emissions technologies on the table and that of necessity must include nuclear power. First, credit where credit is due. The PM has now committed his government to introducing a domestic emissions trading scheme by 2012. In effect that’s a commitment to reduce our emissions unilaterally even if it’s not required under the next round of Kyoto after 2012 (or some other international agreement). On the other hand, he has deferred setting a target for reducing emissions until next year, ie, after the election. That’s really half a policy. It’s like announcing that you’ll introduce a goods and services tax but you haven’t worked out what the rate will be. Or you intend to give a huge boost to health spending, but you haven’t worked out how much or where it will be spent. (Trust us). Trust on climate change action is a double-edged sword. We need effective action but at a reasonable cost to the community. The Liberal Government enjoys the community’s trust that it will have broadly sensible economic policies, but I don’t think the community trusts it to deal with climate change effectively. It has spent the last 10 years taking only modest action on climate change and at the same time has damaged the cause of effective action by rejecting the Kyoto Protocol, supporting the world’s biggest polluter - the United States - in its stance to take no effective action on climate change, and publicly expressing its scepticism that climate change is even a problem. It’s true we’re a small player in all this. Adopting a strong domestic target won’t in itself save us from the risk of dangerous climate change. However, it’s a likely prerequisite for getting our neighbours to play their part. Strong targets will mean that we’re not as wealthy in 50 years as we would be with no targets. But we’ll be much wealthier than we are now. The economic chaos that Howard fears the ALP’s “reckless and irresponsible” target may inflict is being 169% wealthier on average than we are now compared to 184% wealthier if we don’t set a target. Of course, that doesn’t take into account the dangers that climate change presents to our wealth. I reckon being only 169% wealthier in 50 years is worth it to avoid the (small) risk that climate change will make us much poorer, in nasty ways. Nevertheless, the flipside is also true. On the best estimates, climate change will make people in 50 or 100 years poorer than they otherwise would be – but (unless things go really wrong) still substantially wealthier than we are right now. So don’t be too worried about the people of 2100 – they’ll probably be better off materially than you or me. To a large extent, climate change is an economic issue. Some of the problems of climate change will be dealt with better by spending money on adapting than by spending money on reducing the severity of climate change. For example, we could invest billions on reducing the severity of climate change to reduce the spread of malaria that it will cause as warmer regions expand. But we might save millions more lives by investing that money in research into malaria treatments. But, most importantly of all, climate change is not just an economic issue. It will destroy or radically alter species, ecosystems, landscapes, and communities. The extra wealth we’ll gain from inaction won’t compensate us for that. I hope our leaders can show that that’s something they understand. How does it differ from a carbon tax? What are the main political parties proposing? How does Australia fit into the global challenge? What are the economic effects of imposing a cost on emissions? How do you choose an emissions target? Are there any other questions you’d like answered? Let me know: leave a comment or email me at ozelaw [at] yahoo [dot] com. The Prime Minister's Task Group on Emissions Trading has handed down its final report and it is now available. revenue from permits and fees to be used, in the first instance, to support emergence of low-emissions technologies and energy efficiency initiatives (the focus might shift more toward households and business as the scheme matures). That mostly sounds pretty good to me but I think the emphasis is clearly on being business-friendly more than being effective (where those two goals conflict). The idea of a cap-and-trade scheme is that the government sets the maximum emissions, issues permits for that level of emissions and then emitters trade the permits. If one emitter can reduce its emissions for less than the market price of the permit, it will do so and sell the excess permits it has. If another emitter wants to expand and that will involve more emissions, it will need to purchase permits. It will then have an incentive to pursue options that involve relatively less emissions so that it doesn't have to buy as many new permits. If the government stands by ready to charge a 'safety valve' fee to emitters that don't have enough permits, that sets a maximum price on the permits: if it's cheaper just to pay the fee than to buy the permits, you'll just pay the fee, so the permits won't rise above that price. But that means that the cap on emissions isn't really a cap. If emitters pay the fee rather than buying permits, then the cap will be exceeded. From business's point of view it's a good thing: it means there's a known worst-case-scenario in terms of the costs it will impose. But if it's set too high, the reduction in emissions could be much lower than we anticipate. The best way to distribute permits is to auction them. The firms that need them will pay what they are worth and pass on the costs to consumers in higher electricity prices. The government can use the money it raises from each year’s auction to cut income tax, to cut company tax, or to support the development of low-carbon technologies. Polluter after polluter that has made a submission to the Prime Minister’s taskforce on emissions trading has said that while it supports the idea of a trading scheme, it wants the price of the permit set low and it wants to be given enough permits - gratis - to cover most of the pollution it already does.As Australia’s most venerable economic modeler and one of the signatories to the economist’s letter Professor Peter Dixon of Monash University told me: “It’s the same as putting a tax on carbon pollution and then instead of doing something useful with the proceeds - like cutting another tax - giving it to the shareholders of the polluting companies”. Expect a lot of political argy-bargy over this one. I've just been informed that the report will be posted on the Task Group's website at midday today. Today's Sydney Morning Herald has a brief summary and the recommendations are a little disappointing (if not surprising). The good point is that it recommends a domestic cap-and-trade system (with fees for exceeding permit requirements - which makes it more like a hybrid cap-and-trade / carbon tax). no mandatory renewable energy target. The Canberra Times has a slightly better summary and Peter Martin has a good piece on the economics. The Prime Minister’s Task Group on Emissions Trading gives its report to the PM today and is expected to recommend the introduction of a national emissions trading scheme in Australia. I have been pretty sceptical about the taskgroup, given its membership: of the twelve members, five are from within the government, three are from mining / resources companies, one is from a power company, two are from heavy energy users (aluminium and airline companies). Only one (from National Australia Bank) is not from a heavy greenhouse-gas-emitting company. There are no representatives from outside government or big business and no businesses that would have an interest in a strong trading scheme (eg, insurers, agriculture, tourism, renewable energy). The group is also repeating work that has been done pretty thoroughly already: the National Emissions Trading Taskforce was established by the Australian states and territories in January 2004. It presented key design propositions for a successful trading scheme later in 2004, issued a background paper and undertook public consultation in 2005, and presented a proposed trading scheme in August last year. As far as I’m aware, the federal government declined to have any involvement in the NETT process. The states and territories have committed to a national state-based scheme by 2010 if the federal government fails to introduce its own national scheme. Australia enjoys major competitive advantages through the possession of large reserves of fossil fuels and uranium. In assessing Australia's further contribution to reducing greenhouse gas emissions, these advantages must be preserved. Against this background the Task Group will be asked to advise on the nature and design of a workable global emissions trading system in which Australia would be able to participate. The Task Group will advise and report on additional steps that might be taken, in Australia, consistent with the goal of establishing such a system. Nevertheless, the media are tipping that the taskforce will recommend a national trading scheme. If so, it’s remarkable that the government lags behind even the most reactionary businesses with the most to lose from action on climate change. Why does the PM have to wait until even coal miners and electricity generators call for some action on climate change? 1. Comprehensive coverage of the main emissions sources. 4. Permits should be auctioned, not handed out to existing big polluters for free. 5. It should be able to link in with foreign schemes. 6. Allow the market to work unconstrained. 7. Ensure medium-term economic certainty (ie, fixed emissions caps) but longer-term flexibility to adjust caps if necessary. We should see the report later today or tomorrow – it will be interesting to see what it says. The PM will apparently respond on Sunday. The opposition has attempted to steal the PM's thunder by issuing its own policies today (including a national emissions trading scheme by 2010 coupled with a mandatory renewable energy target) – they are mostly pretty good but I’m not sure there’s anything new there they haven’t announced before. 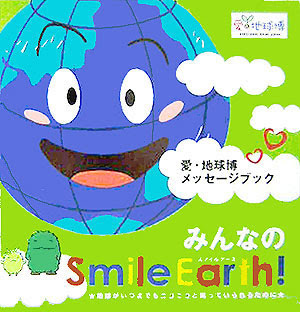 You've probably heard about the Live Earth concerts around the world on 7/7/07 to "engage people on a mass scale to combat our climate crisis". Tickets for the Australian show in Sydney go on sale tomorrow morning at 9 am. $99 including public transport to the show. The line-up looks really good. Vincenze has alerted me to an unofficial Live Earth blog which is quite interesting too, with news and gossip on the concerts (plus some serious environmental news). Update: Tickets are sold out but I have a couple of spare tickets to the Sydney Live Earth concert if you missed out - drop me a line asap! I wrote a couple of weeks ago about the possbility of long-term weather markets helping us to understand and prepare for climate change. I've since found a smattering of information on this topic elsewhere, although not as much as I'd expect given the large amount of information on on prediction (or betting) markets for things like elections. a website on climate change betting by James Annan, a scientist involved in climate prediction. His blog has some interesting stuff too. There's an article in Reason Magazine. Wandering a bit off-topic but a conceptually similar operational hurricane futures market allows meteorology researchers and students to invest real money ($5.00 - $500.00) in securities whose payoffs depend on where a given hurricane makes its first landfall. The prices of these securities is then used to forecast where a hurricane will actually land. The New York Times had a very readable article a couple of months ago on prediction markets. Prediction markets have already been used in a variety of contexts with remarkable success. For example, prices of economic derivatives predict economic variables better than professional economists; prices in Iowa political markets are typically more accurate than the polls in forecasting elections; and prediction markets at Hewlett-Packard Labs beat official forecasts of printer sales most of the time. Prediction markets reflect an old thought that underlies the price system: Information is widely dispersed in society, and it is highly desirable to find a mechanism to collect and aggregate that information. These markets work for several reasons: First, almost anyone can participate. Second, people think hard when they have to back up their predictions with money; buy the right presidential contract and you win, buy the wrong one and you lose. Third, the profit motive encourages people to look for better information. I'll keep following this theme on the blog. It seems to me that even a small betting market on long term temperatures (or associated climatic changes) could be a very cheap way to improve our understanding of climate change risks. Welcome to the first in what I intend to be a regular series: Oikos 101. Here I’ll attempt to explain useful economic, ecological or environmental policy concepts in a way that’s simple but still accurate. (If it’s not simple or is inaccurate, please let me know). I’ll then use these concepts in future posts without the need to explain them each time. The first concept is an important one in economics: price elasticity. Elasticity generally is a measure of responsiveness: how much one variable changes when another variable changes. The more “elastic” something is, the more responsive it is. Two important elasticities in economics are the price elasticity of demand and the price elasticity of supply. When the price of something goes up, the quantity that consumers demand generally goes down. If McDonalds doubled the price of its Big Macs, people would by fewer Big Macs. (Some would switch to Whoppers, some would cut back from two Big Macs for lunch to one, some would decide it’s finally time to take their own sandwiches to work, etc etc). The price elasticity of demand refers to how much the quantity demanded changes as price changes. Different goods have different price elasticities. Some things are easy to avoid or substitute for. When the price of bananas shot up in Australia after Cyclone Larry devastated Queensland banana plantations last year, people mostly bought other fruit or just ate less fruit. We can describe demand for these sorts of items as price-elastic or just elastic. (The quantity demanded is quite responsive or sensitive to changes in price). Other things are difficult to avoid or substitute for. If the price of cigarettes increased suddenly, some people would quit or smoke less, but many would not change their habits much. Demand for cigarettes is relatively inelastic. (The quantity demanded is quite unresponsive or not sensitive to changes in price). We can also look at the price elasticity of supply. Again, let’s look at bananas in the aftermath of Cyclone Larry. The price that producers could get for their bananas rose substantially, but it takes a while for bananas to grow. So in the short term, growers couldn’t take advantage of the high prices by supplying extra bananas. Perhaps some overseas producers could ship more bananas to Australia. But many overseas producers are prevented from selling bananas to Australia because of Australia’s strict quarantine laws. So, in the short term, supply was not very responsive even to the much higher prices: we would say it was inelastic. It’s also important to note that the elasticity of a good depends on the price of that good. Imagine petrol is so cheap that it costs me only $10 to fill the tank of my car. If the price increases by 50% to $15 a tank, I still probably won’t cut back on my driving very much. However, if the price of petrol meant that it cost me $50 to fill the tank and it then rose by 50%, that change would have a much larger impact on my consumption. So at low prices, petrol is highly inelastic (it’s so cheap that even if you double the price I’ll still buy almost as much) but at high prices it’s elastic (I’m already near breaking point, if the price doubles I’ll buy much less – I might even sell my car). Looking at elasticity of their products is important for businesses (will I lose many sales if I put the price up?) but elasticity is also useful for looking at a number of environmental and economic policy issues. So, for example, if we want to reduce water use and we’re thinking about water restrictions versus an increase in water charges, we might want to know how elastic the demand for water is. If it’s highly inelastic, so that consumption will not respond much to price increases, we could conclude that modest price increases aren’t going to be very effective: we’ll need to look either at substantial price increases or other measures such as water restrictions. Should women be taxed at a lower rate than men? Do parking levies reduce traffic congestion? Will climate change get a run in tonight's budget? Federal Treasurer Peter Costello hands down his 10th(?) budget tonight. Will climate change get a mention? Not much, according to the budget 'leaks' so far: there seems to be an extension to the solar rebate and little else. Anyway, have a punt at the Greenpeace website on how many mentions there will be and win a solar backpack. The competition closes at 5pm. Markets are good at aggregating information. When individuals - each acting according to their own personal preferences, ideas and knowledge - interact in a market, the market price that is set for a commodity reflects society’s best guess about the commodity's value. For example, shares in Telstra can (probably) be bought and sold by Telstra employees, share market analysts, Telstra’s competitors and customers, telecom regulators (maybe), directors of overseas telco companies, etc etc. Each of these individuals has their own thoughts, based on their own expertise, of Telstra’s business and prospects. The resulting share price reflects a consensus on Telstra’s value. When individuals make economic decisions based on diverse sources of information, market aggregates – such as prices – will to a greater or lesser extent reflect the pieces of information received. By observing a market aggregate, each person may learn something about the information possessed by others. In some cases, enough information is reflected to induce everyone to agree on a consensus estimate of the relevant uncertainty. This theme has been extensively explored in the literature on rational expectations. Another example: individual punters at a horse race may have particularly good knowledge of one or more of the horses in the race (how fit they are, what sort of conditions they like), the jockeys, the track, etc. When combined, they give odds which represent the betting community’s best estimate of the probabilities of each horse winning, distilled from this dispersed information. The odds in these sorts of betting markets give a good indication of future events. For example, economists Andrew Leigh and Justin Wolfers have found that election betting markets are good at picking election results, and certainly better than polls on intended voting behaviour (papers here and here). We have three bet periods -10, 15, and 20 years - and two bets for each period - an even-odds bet and a 2:1 bet in David's favor. The even-odds bet centers around a temperature increase rate of 0.15C/decade with a 0.02 void margin on either side (bet voids if temps increase between .13 and .17C/decade). The 2:1 bet centers on 0.1C/decade with a .01 void margin. Even-odds bets are for $1,000 each, and the 2:1 bets increase over time, with me betting $1,000, $2,000 and $3,000, and David betting half that. My exposure is $9,000; his is $6,000. So I was thinking: What if someone set up some decent markets in future global temperatures? Anyone would then be free to bet on how much climate change they expect in the future. There are already weather markets for short-term weather events, so it shouldn’t be too much of a stretch. It would give an independent estimate of likely magnitude of climate change based on individual scientists, companies, individuals, etc all betting on how much they think temperatures would rise by based on their understanding of climate change science. This would be very valuable to guide government policy and private sector decisions. Some people have criticised the scientific integrity of the Intergovernmental Panel on Climate Change (IPCC) estimates of climate change because they are based on consensus and therefore ‘political’ and biased. There could be no such criticism of this process – people would be acting independently and putting up their own money. Climate change sceptics (and believers) could put their money where their mouth is: if they’re so convinced that we’re not at risk from climate change, they could make a motza. (And it would test the claims from some quarters that this is some sort of vast left-wing conspiracy). There would be incentives to invest in climate change research, as people could make money from it: if you understand the likely future climate better than (or before) everyone else, you can make money on the markets. People could use it to hedge or insure their exposure to climate change impacts. For example, say the market assesses the chance of very large temperature rises of 5 degrees in the next 50 years is 1 in 1000 and so I can make a bet on that level of change that pays 1000 to 1. Now, if I own a beachside house that will be ruined by sea level rises associated with a temperature increase in that range, I could bet say $1000 now that temperatures won’t rise by 5 degrees in the next 50 years. If they don’t rise that much, I’ve only lost $1,000. If they do rise that much, I can use my $1 million to buy a new house. Ski resorts could hedge some of the risk of declining snowfalls from higher temperatures. This could be helpful to all sorts of businesses, especially insurance companies, helping them to assess risks and cover them. Wouldn’t a government or financial institution be providing an enormously helpful (and potentially profitable) service by setting up such a market? 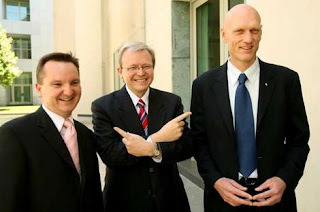 "You've got this ridiculous situation where the Greens are advocating an 80 per cent cut by 2050, the Labor Party is only slightly less radical at 60 per cent by 2050," Mr Howard told ABC radio. "Neither the Greens or the Labor Party has any idea of what that will do to jobs. I think it is crazy and irresponsible of any political party in this country to commit to a target when you don't know the impact of the target." …the goal of Annex I [developed country] emissions reductions of 60% by 2050 may be considered a minimum estimate of the effort needed to achieve stabilisation to avoid DAI. (CSIRO, pdf here [see pages 17-18], my emphasis). Fresh from defending himself against allegations of a conflict of interest [over his dual roles as Australia’s Chief Scientist and chief technologist for mining company Rio Tinto], the Chief Scientist, Robin Batterham, said Australia must halve its greenhouse gas emissions by 2050. Talk of such a target by the Federal Government's most senior scientific authority is in stark contrast to the recently released white paper on energy policy which broadly supported Australia's continuing use of fossil fuels, a major source of man-made greenhouse gases. Dr Batterham said he supported the Federal Government's decision not to ratify the Kyoto protocol on climate change because the reductions it set were not high enough. "I'm talking about enormous reductions - 80 per cent by the end of the century," Dr Batterham said. "Fifty per cent by 2050, I think, is realistic." Of course, it's not true that we have no idea of the economic impact of these proposed targets (more on that tomorrow). 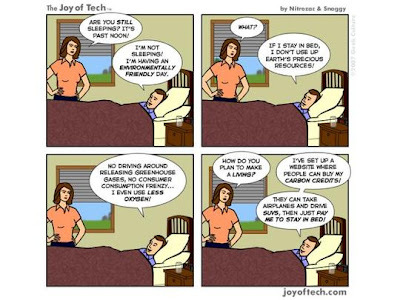 But the more important point is this: any target has costs and benefits. The costs are obvious and are what the government has focussed on: higher energy prices and resulting lower profits and job losses in fossil fuel industries. The benefits are more dispersed: jobs and earnings in renewable energy, indirect benefits of policies to reduce energy waste (better energy efficiency, more economically efficient transport, and reduced air pollution), credibility in the global debate on climate change and, the biggie, reduced risk and severity of adverse climate change. If you don’t set a formal target, you’re simply setting a target by default: a target of emissions increases. This unstated target has costs as much as a stated target does. If setting a target based on an incomplete knowledge of all the costs and benefits – a ‘best guess’ target – is irresponsible, how much more irresponsible is not setting a target at all – just letting whatever may happen happen? Is that any way to decide policy? Today I’d like to pose a scenario to think about. Imagine you live with your family in an enormous 5 bedroom house in a small, mostly self-sufficient development. There are 3 other properties in the development. There’s an apartment block with 12 small apartments. There’s a little complex of 12 luxury townhouse villas. And there’s 20 families living in a commune, growing their own food. It’s an eclectic community but everyone gets on well. As part of its self-sufficient nature, the development isn’t connected to town sewerage. Instead there’s a large septic tank that breaks down sewage so it can be safely used as fertiliser on the farm and water for gardens. But there’s a looming problem. The septic tank is almost at capacity. Within a couple of years at current usage, it’s going to reach capacity and regularly start overflowing raw sewage, mainly onto your property and the commune. A new tank is prohibitively expensive. And usage is set to increase: a couple of new villas are being built and the commune has plans to expand. The residents convene a meeting and start by looking at everyone’s sewage levels. The 12 families in the luxury villas use an enormous amount of water and contribute correspondingly enormous amounts of sewage to the tank. The 12 families in the apartment block contribute only about half as much and the 20 families in the commune even less. Your family doesn’t contribute very much in the scheme of things, but with a huge house and garden, still contributes more than any other family in the whole place – even the rapacious villa dwellers. The residents agree that, to start with, the two biggest contributors – the luxury villas and the apartments – will reduce their contributions by 10%. Your family won’t have to reduce its sewage but you agree not to increase it by more than a very small amount. Everyone agrees that the commune, which doesn’t produce much sewage anyway and is considerably poorer than everyone else, won’t have to do anything just yet but will monitor its sewage. No doubt you can see where I’m going with this, but let’s continue. You don’t want to be wallowing in sewage within the next couple of years, so you sit down with your family and work out a plan. One member of the family has talked to a plumber and reckons that total sewage inflows have to be cut by at least 60% to keep the tank operating pretty much within capacity with only maybe an occasional spill. She suggests that the family aims to get its sewage down to 60% below its current level, by taking shorter showers, diverting some of the shower water to use on the garden and getting more efficient appliances. Another family member reckons this will be way too hard and way too expensive. He’s had a chat to the owners of the luxury villas and they reckon it’s too expensive too. He reckons the best option is to go along with the villa owners and not do anything right now. Now, it’s obvious that neither of these is going to solve the problem we face. Both will lead to our backyard being inundated with sewage in short time. Of course, what we’re really talking about in this crude allegory is climate change. Australia is the wealthy family with a big house. The US is the complex of luxury villas. Europe is the apartment block and the developing countries are the commune. The two family members’ approaches represent the dominant approaches from political parties (and green groups) in Australia. Green groups focus way too much on domestic emission reductions and ignore Prime Minister Howard’s valid point that our domestic emissions are but a small part of the problem. The Liberal Government though has been grossly irresponsible: it has done its best to undermine any international solution to the problem and has let the US off the hook. This, rather than failing to set a domestic target or not doing enough to reduce emissions, is its biggest policy failing in my view. It hasn't recognised the precarious position that we’re in, as both a wealthy contributor to the problem but also (unlike the US and Europe) a country that is going to be disproportionately affected by climate change. Australia should be forcibly arguing for action in the international sphere. And we should take substantial action domestically: not because that will itself make a huge dent in the problem but because it’s the right thing to do and, perhaps more importantly, it’s an absolute prerequisite to arguing strongly (as we must) for other, bigger, countries to take action that will make a big impact. Most of our neighbours are showing a remarkable level of neighbourliness in being prepared to make big sacrifices for a problem that affects us a lot more than it affects them. It’s time to get on board and get the neighbours all pulling in the same direction. I was part of a discussion panel on this issue on Triple J’s current affairs show Hack on Tuesday night, concentrating particularly on the economic implications of setting a target for reducing greenhouse gas emissions. There were some interesting perspectives. You can listen to it here on the Hack website (and I’m on about 21 and a half minutes into the show, if you’re interested!). Via the new Ecocene blog, I’ve been alerted to an ‘ecolibertarian’ blog authored by David Reevely, a Canadian journalist with the Ottawa Citizen. David is “working out how to be a libertarian and an environmentalist at the same time” and has some great posts about environmental economics and environmental policy from a libertarian / small government perspective. Two recent posts that caught my eye: commentary on the proposal to introduce a congestion charge for driving in Manhattan and the difficulties in trying to value a tree. Rain has been bucketing down in Sydney over the last couple of days but it has been a different story in the catchments that receive the water for Sydney’s water supply. According to the Sydney Morning Herald, 80 millimetres has fallen in the city’s north and 40-50 mm in the east, but only 10-20 mm in the west and less than 10 in the catchment areas. While emergency services in the city have been battling overflowing drains, gutters and leaking roofs, dam levels have fallen by 0.3% in the last week. This underlines the problem with having Sydney’s water supply piped from areas that are much drier than Sydney is. Some possible solutions? Catching some of the stormwater and diverting it for industrial uses is one. Rainwater tanks for homes are another. 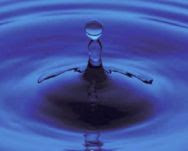 A report last week commissioned by the Australian Conservation Foundation, Nature Conservation Council (NSW) and Environment Victoria examined The economics of rainwater tanks and alternative water supply options (pdf). The findings are not very surprising: water tanks are most cost effective in areas where there are high rainfalls and for houses with large roofs (where they can collect more water). There are plenty of those areas in Sydney. The cost per kilolitre for large tanks in high rainfall areas is less than a small desalination plant and not much higher than a larger plant. When you factor in the reduced pressure on stormwater systems and emergency services that comes from diverting some rainfall during storms into household water tanks, it’s a fair bet that the social cost of water tanks is lower than desalination. When you factor in environmental costs, rainwater tanks become cheaper again: a desalination plant powered entirely from green power, as has been promised by the NSW Government, is a fairly expensive proposition. However, there’s another very cheap measure that doesn’t get much attention: you can divert rainwater from your downpipes directly onto your garden – or your pool, if you have one. You can buy a diverter for less than $40 (I found a few websites from distributors) and your rainwater can go straight into a hose and out onto the garden. (‘Raingardens’ are popular in the USA). Now, I don’t know how much this would reduce your water consumption by – after all, gardens are getting watered anyway when it rains – but it’s essentially zero cost and reduces pressure on stormwater systems. And it means your garden gets a thorough soaking when it rains. I lived in a house in Sydney a couple of years ago where the downpipes diverted directly into two garden beds and they rarely needed watering. For backyard pools, it makes no sense to fill them from mains water when this option is available: an added advantage is that rainwater is much warmer than mains water. Industrial water recycling and desalination may well be attractive measures as the drought continues: but household level measures can make an important contribution at a modest cost. A fascinating article by economics writer John Garnaut in the Sydney Morning Herald today argues that women should be taxed at lower rates than men. The reason is that women are more responsive to tax rates than men. If we assume that markets generally work pretty efficiently to allocate goods and services to where they are most useful and valued, then ‘good’ taxes are those that distort market outcomes the least (and those which compensate for market failures and actually help markets operate more efficiently). We should tax things in a way that minimises the extent to which people change their behaviour as a result of the tax. One of the criticisms of high income tax rates is that it can change people’s behaviour in that it becomes less rewarding to go and work and produce socially useful things. But if, as Garnaut suggests, men tend to go off to work without much regard to the tax rate, whereas women’s decisions on how much to work depend more on the financial rewards, then you can afford to tax men more than women. A 10% increase on income tax that women pay will reduce their incentives to work substantially more than a 10% increase on income tax for men. Garnaut refers to a study by economists Alberto Alesina, of Harvard University, and Andrea Ichino, of the University of Bologna, which finds that the "optimal" tax rate is much lower for women than for men. It varies from country to country because of different participation rates and cultural factors, but they suggest that women should be taxed at between 60-90% of the rate for men. [Alesina] and Ichino argue governments could get away with reducing the female tax rate by a lot, and increasing the male rate by only a little, without affecting the budget bottom line, because taxpaying women would storm into the labour force but taxpaying men would be reluctant to retire. Governments would reduce the amount of tax-driven distortion in the economy per unit of revenue. Men would spend a little more time with their kids. Women would improve their bargaining power within the home. It would help overcome all kinds of gender discrimination in the workplace, as women would be prepared to work for lower pre-tax wages (because they would still receive more after-tax pay). It would help compensate women for bearing the brunt of maternity and child-rearing. "From an employer point of view it would then become cheaper to hire women, therefore favouring women employment and their promotion to higher paid jobs," they say. What an interesting idea. What do you think? Lawyers leading the way on climate change? People around the world are starting to sue each other over climate change. There have been some interesting cases and there are more in the pipeline: probably the biggest is California's action against car manufacturers. So it's only a matter of time before a global warming litigation industry builds up a decent head of steam. One would think the scientific evidence is sufficiently in to meet a civil standard of proof. I've written before about climate change litigation, both here and at the now-dormant Australian environmental law blog, ozelaw. Climate change cases will become less common, not more common. Litigation, if it's good for resolving any disputes, is good for resolving simple disputes between two parties. Climate change is a big, global, complicated problem, where everyone in the world is a potential plaintiff (we'll all be affected to some extent by climate change) and everyone is a potential defendant (we all contribute to it). Attributing blame and working out damages is fraught to say the least. In my view, climate change litigation will not do much to prompt good policy. And I think there's a danger if sympathetic judges overreach and these cases are successful. Take the California vs car-makers case, for example. California argues that it will incur costs due to global warming contributed to by people driving cars made by car-makers. I don't doubt that's true. But should car-makers compensate the Californian government for that? I'm sure the Californian government itself has undertaken a lot of action and made a lot of decisions over the last century that has contributed to global warming. Should the government of Tuvalu, low-lying Pacific island that's greatly affected by climate change, sue the US for the industry support it has provided to car manufacturers in the past? Should it sue the State of California for not banning cars as soon as global warming hit everyone's radar? Would California then seek a contribution from Brazil or Indonesia or Australia for allowing forests to be felled? This is a problem that requires global co-operative solutions and I don't think legal blame games are going to help. Climate change cases have been a good way to get climate change on the agenda, because the media seems to love a good legal stoush: where big global dramas get played out in the microcosm of a courtroom, reduced to some bite sized legal arguments and decided neatly by a judge. (If you ever actually read these cases though, they tend to come down to something arid like whether section 35ZZ requires a consideration of all "relevant" factors or only all "pertinent" factors and whether there's a difference between "pertinent" and "relevant". The big issues of principle are notably absent). Anyway, there's no doubt that climate change is on the agenda now - I'm not sure what more these cases will achieve. Hot rocks: a cheap and clean energy solution? Dr Williams expects the company to send electricity to the national power grid by 2010 and later directly to western Sydney. By 2015, it could produce as much electricity as the Snowy Mountains hydro scheme. Some scientists say hot-rocks technology could soon deliver huge volumes of economically viable power, thanks to the continent having the hottest and most geologically favourable granite deposits on earth. The greatest impediment to the renewable energy industry is that the nation's electricity is among the cheapest in the world, thanks to huge deposits of high-grade coal. But geothermal energy is expected to be economically viable after a moderate cost is imposed on greenhouse gas emissions. Geodynamic, assisted by $11.8 million in federal grants, said it would produce one megawatt of electricity for about $45 an hour - compared with coal power of about $35. The Prime Minister's taskforce on nuclear energy estimated the cost of nuclear energy at $40-$65, "clean coal" at $50-$100 and photovoltaic solar energy as high as $120. So what should we do about geothermal power? Should we be investing in it? Or in solar and wind? Or in clean coal? A low risk strategy would seem to be to start putting a price on greenhouse emissions, through some kind of carbon tax or emissions trading scheme, and letting investors put their money into what they assess to be the technologies that offer the best opportunities for power that’s relatively cheap and low-emission. These could be kick-started, where appropriate, by modest grants. Of course, you don’t actually need to put a price on emissions to encourage investors to put money into researching and commercialising these technologies. There’s no price on emissions at the moment – coal power stations can emit all the carbon dioxide they like and they don’t have to pay a cent – but investment is occurring. The reason is that everyone realises there will be a price on emissions in the future and it’s time to start investing accordingly. I suspect this is one of the reasons we’ve seen the apparent paradox of industries that stand to lose from carbon taxes and the like actually advocating that governments introduce a clear carbon price. If they have a good idea what the price on emissions will be over the coming decades, they can plan how much to stick with coal or oil and how much to invest in alternatives. At the moment, all they can do is speculate.